Its objective is to review and discuss essential issues of todays world and project a panorama of international economic relations. Presidents of Ecuador and Bolivia to visit HavanaThe 1,000-plus participants from 52 countries include eminent figures like Rafael Correa and Evo Morales, presidents of Ecuador and Bolivia, respectively; as well as Robert Mundell and Eric Maskin, winners of the Nobel Memorial Prize for Economic Sciences in 1999 and 2007, respectively. 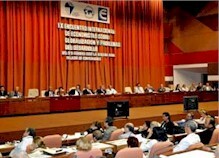 According to Esther Aguilera, vice president of the National Association of Economists and Accountants of Cuba, the issues of world interest to be discussed in conference panels and commissions include the international financial crisis, Latin American integration, biofuels, cultural identity and the energy-environment relation, and cooperation for development.